MyGet symbols support lets consumers of our NuGet packages step through the source code and integrate with Visual Studio and tools like WinDbg. MyGet comes with its own symbol server that supports pushing symbols as well as consuming symbols and source indexing. Both managed and native assemblies and symbols are supported. Using the nuget pack command, you can create a normal .nupkg and a .symbols.nupkg file with the -symbols option. The symbols package must contain both the .dll and .pdb file, together with the source files. Check the NuGet documentation for more information and an example of a .nuspec file. When working with NuGet.org, the NuGet client automatically recognizes symbols packages and pushes them to the default SymbolSource feed. Since we want to ensure our packages end up on our own feed and securely host debugger symbols, we must explicitly push symbols to the MyGet symbol server. To debug a NuGet package for which symbols are available, we will need the symbols URL for use in Visual Studio. After logging in to MyGet, we can find this URL under the Feed Details tab of our feed. Tip: MyGet provides two symbol server URLs: one that requires authentication and one that contains an authentication token in the URL. The first will prompt for credentials when used (Visual Studio 2015 and beyond). The latter one will not, as it contains an authentication token. It is recommended to keep the symbols URL to yourself at all time: it's a personal URL in which security information is embedded in the form of a guid. If for some reason this gets compromised, please reset your API key. Enable Just My Code should be disabled. Enable source server support should be enabled. This may trigger a warning message but it is safe to just click Yes and continue with the settings specified. Keep the Options dialog open and find the Debugging | Symbols node on the left. In the dialog shown, add the symbol server URL for your MyGet feed, for example https://www.myget.org/F/somefeed/auth/11111111-1111-1111-1111-11111111111/symbols. The package details page for a package that has symbols available comes with a nice utility that enables us to browse the source code embedded in a symbols package. The following list of tips might be useful to you if you hit any issues when configuring the debugger. If you have some other tips to share, contact MyGet support or submit a pull request for this page. Note: MyGet does not index any binaries found in the package's \tools folder. The way Visual Studio and other debugging tools match an assembly and PDB file is by using the assembly hash. This hash is stored in the .dll and .pdb file and must match for debugging and source steping to work. On the package details page on MyGet, we can verify if for a given assembly debugging and source stepping is possible. MyGet shows the assembly name, the assembly hash and whether source stepping will be available for it or not. Note: To verify this match when creating packages on our system, we can use the ChkMatch tool. The author of this tool also provides a comprehensive article about matching assemblies and symbols. In the Visual Studio Debugger options, you can disable the Require source files to exactly match the original version toggle if you are confident the .dll and .pdb can be different. We advise against this as the debugging symbols that will be loaded come from a different build than the one you are tying to debug, but it can be a last resort to get at least an idea of the source code for the assembly being debugged. Portable PDB hashes will look different from Windows PDB hashes, because of the SSQP Key Conventions for Portable PDB's. 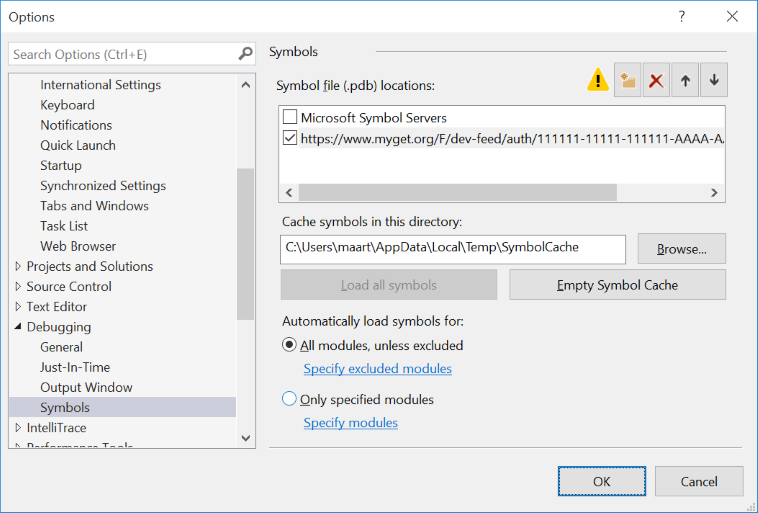 Note for users generating Portable PDB's (.NET Standard / .NET Core): MyGet can serve the .pdb file to Visual Studio, Rider, WinDBG etc., but we can not rewrite the PDB file to allow linking to source code. Portable PDB's work differently in this regard. To support source stepping, we recommend using SourceLink. When stepping into source code, Visual Studio or WinDbg uses the .pdb file to link the assembly with corresponding code. MyGet indexes the .pdb file after uploading a package. This indexing process adds a second path to the .pdb file, telling Visual Studio where to find the source files. If the source code is still on the machine where a symbols package was created, and we try to debug on that machine, the .pdb file that is downloaded will reference both the local path to sources as well as the path on MyGet. Since the sources are still available locally, Visual Studio will never reach out to MyGet to download source code files. If this is undesired, make sure to rename the local folder containing the original sources (or use a different machine to perform debugging). Symbols packages contain the .pdb files that link the assembly with source code. When only .symbols.nupkg packages are pushed to a feed, we can consume the package like any normal package and MyGet will properly recognize the package as a symbols package. When trying to debug using such package, Visual Studio will find the .pdb on disk instead of reaching out to MyGet to download it, and will fail stepping into code because of that. The solution here is to always push .nupkg as well as .symbols.nupkg packages to a feed so that Visual Studio has to reach out to MyGet for fetching debugging information. When a .nupkg contains .pdb files, Visual Studio will never reach out to MyGet to download symbols and sources. When trying to debug using such package, Visual Studio will find the .pdb on disk instead of reaching out to MyGet to download it, and will fail stepping into code because of that. .nupkg must contain assemblies, content files, ..., but never .pdb files or a src folder. .symbols.nupkg may contain assemblies, content files, ..., and must contain .pdb files and a src folder. There is a useful plug-in for NuGet Package Explorer which allows us to validate our symbols packages. To install the plug-in, open NuGet Package Explorer and use the Tools | Plugin Manager... menu. In the dialog that opens, click the Add Feed Plugin... button double-click the SymbolSource plug-in from the MyGet feed. This plugin enhances the package analysis tools with additional rules that should help detect 99% of the problems with symbols packages. 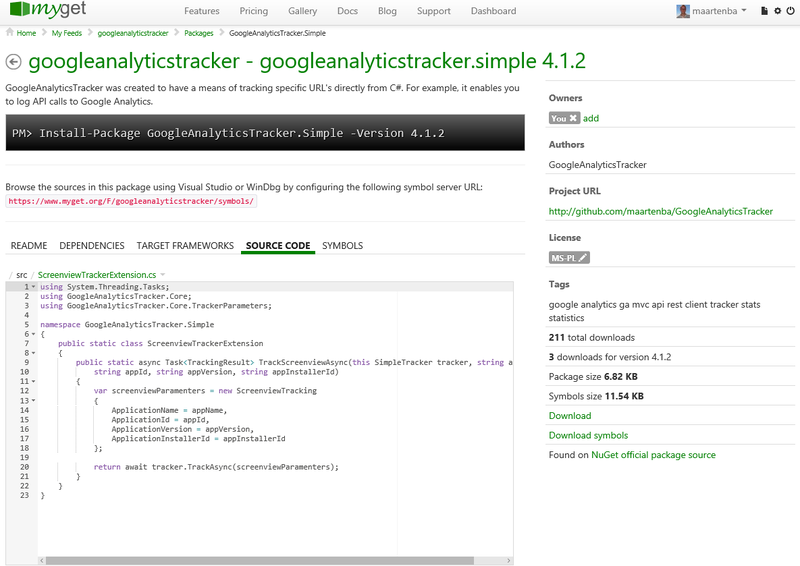 Once installed, open a symbols package and validate its contents by selecting Tools > Analyze Package or hit CTRL-Q. A common root cause for symbols missing in the symbols package originates from a too restrictive .nuspec file. The one below will filter out all non-DLL files from the package. The NuGet client tools are smart enough to filter out PDB files from non-symbols packages (unless you explicitly include them).